I live in Colorado and love the mountains, so I wanted to get a dual sport motorcycle that would allow me to ride on and off-road. I'm really not excited about riding the highways, but I can't wait to explore the back roads and remote mountain passes of my beautiful state. I struggled finding a dual sport bike that actually fit me and my SHORT LEGS (29 inch inseam). Thank you, BMW, for making a low bike with a low seat option that allowed the bike to fit me! 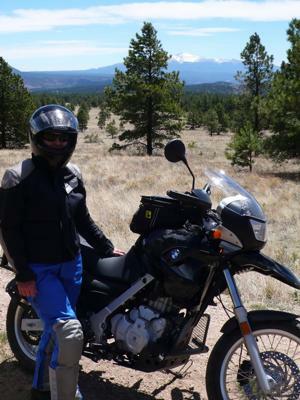 After my motorcycle safety course and getting my endorsement, I had only ridden my BMW three times. Last weekend for my fourth ride, I got the full off-road experience: gravel roads, 2-track ATV trails, deep sand, rocks, tree roots, etc. I did great and so did the bike. My boyfriend/motorcycle coach/mentor couldn't believe it. Thankfully, I am an advanced mountain biker, so the mountain biking experience definitely helped me get my motorcycle through the technical trails and understand how 2 wheels perform in sand and gravel (and to not freak out). I still have a lot to learn and am working on my slow-speed maneuvering skills, but I'm so excited about my bike and all the places I will go with it! It's also great to hear that this bike is doing well as it is what I want to eventually "trade-up" to (I currently ride a Suzuki VL250 Intruder). I also love that the seat height can be lowered and that it's a gutsy off-roader to boot. Thanks for sharing. It is wonderful to find your perfect bike, especially a dual purpose bike. Sounds like so much fun! I miss riding off road with the challenging terrain and closeness to nature. Please continue to share your rides with us and pictures! I am so excited for you! I have an almost identical bike, the BMW G650GS, and like yours, it has the low seat and low suspension, so I can flat foot it. It is truly an awesome bike. Way to go BMW! People always think BMW's are too expensive, but the single cylinder GS bikes are very reasonably priced, especially if buying a gently used one. I love the versatility of being able to take it on and off road. It actually makes a comfortable street bike in addition to its off-road capability. I envy you your location in Colorado. Wish I had more off-road opportunities here in Alabama. Keep riding. It sounds like you are doing a wonderful job. Enjoy this great new adventure! Wow all the BMW's I have seen are really high and most of the people that ride them around where I live are tall men with long legs. Thanks for the heads up on this bike. I like riding off road and would certainly think about this great bike. Have fun riding the back roads that is my favorite also.